This is a dental malpractice case filed by a man in Prince George's County. This is the first dental malpractice lawsuit filed in Maryland in 2017 (the 8th lawsuit overall). This suit was filed in Maryland Health Claims Arbitration on January 9, 2017. Plaintiff receives a dental implant by defendant doctor. During the procedure, either while drilling the tooth or while placing the implant, defendant dentist goes too deep into the man's jaw. This traumatizes his mental nerve. Plaintiff reports this to the doctor during a later appointment. Defendant doctor then removes the implant. However, defendant dentist does not initiate any steroids, and does not refer him to an oral surgeon to have the nerve repaired. As a result of the injury and the failure to repair the injury, plaintiff claims that he had to spend a large amount of money for his dental treatment. This is a barebones complaint filed on the eve of the statute of limitations without an expert report. There are a lot of dental malpractice cases filed in Maryland and the majority of them follow a similar script. The patient usually receives a dental implant and or gets wisdom teeth extracted and the doctor hits a nerve, usually the lingual nerve. If you have been injured during a dental procedure due to the negligence of a dentist or doctor, Miller & Zois can help you get the justice and compensation that you deserve. We have a history of success in medical malpractice cases. Give us a call today at 800-553-8082, or go online for a free case review. Dental claims in Maryland. Do you have one? Let's figure it out. 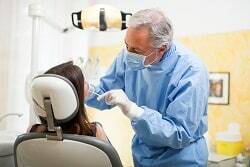 We talked above about how dental malpractice cases tend to be smaller value claims. There are many exceptions. One type of dental malpractice case the damages are often very high is when the dentist's blood thinner management causes a stroke.